Many years ago I volunteered to give blood at our local church meetinghouse. It was a few miles away and right on the way to one of our local museums. So, I decided that after giving blood, I would take my five kids and my wife and visit the Babe Ruth Museum in Baltimore. It took only a few minutes for me to give blood so my wife and kids waited in the car. Then it was off for a day of Saturday family time. However, as I drove out of the church parking lot and onto the freeway I suddenly felt faint and I was only able to mumble to my wife that I felt light-headed as I desperately steered the car off the road onto the shoulder. That is all I remember. I wasn’t out long, but when I came to, I felt nauseous and sick to my stomach. Fortunately I had gotten onto the shoulder of the road before passing out. The family trip was off and I spent the next 24 hours in bed feeling sick as a dog. I have never given blood since. That one bad experience soured me on participating in blood drives ever since. 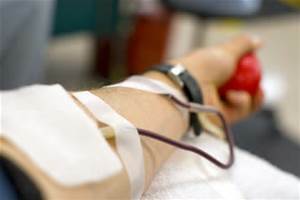 I’ve had hundreds of opportunities to do a good deed by donating, but sadly for me, and for those who could have benefitted from my B+ blood, I can’t get past that horrible experience. I hope to overcome my own fear of giving blood. One bad experience shouldn’t make for a lifetime ban of the good that comes from its donation. Of course, all of us can do much good without organizations, yet, there are some organizations, such as churches, that accomplish good things that can only be done in unison by a group of people. Like the blood that flows through my veins, let us “B+”, and learn to give up the past for the good of our future. Let us consider the good we can do when we unite our souls together as one. It might be time to let old wounds heal and past disappointments fade in our memories. As followers of Christ, let us not faint to return to the fold and join with the saints in building up the kingdom of God here on earth.